OK. So Hannah can't actually say, "Mama I'm a Big Girl Now," but as I continually stress to Chris actions speak louder than words. 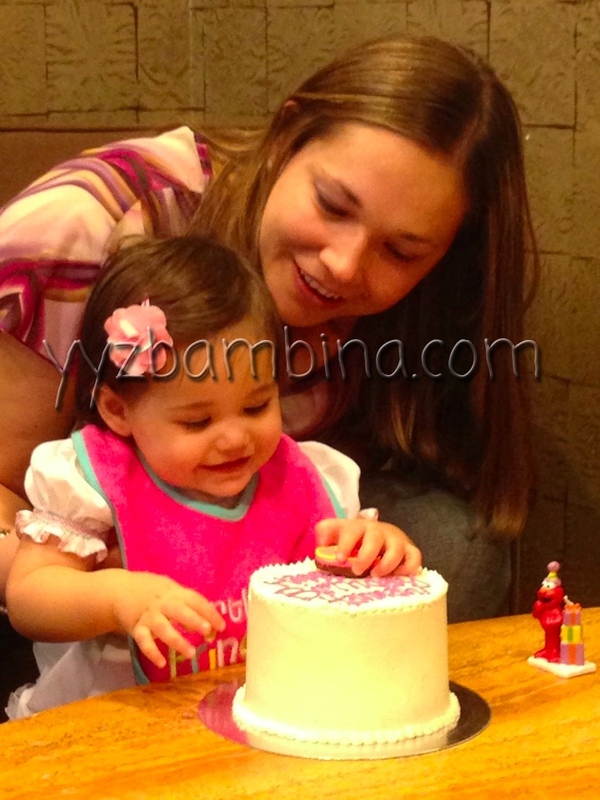 Last week Hannah turned 1. I have been fighting a nasty cough/cold since I returned to work and on her actual birthday I was so sick I had to stay home from work and only saw her for like an hour. I know she didn't realize it was her birthday, but I still felt a lot of Mom guilt. Especially when she wanted to cuddle and I kept leaving her to cough loud enough our neighbours could probably hear. One of the things I really wanted to do is write a list of all the awesome things she can do at 12 months. She's mastered 7 words. She can eat bigger pieces of food, and bites things herself without us having to break it up for her (as proven when she devoured one of her customized Elmo birthday sugar cookies). She crawls to whatever she wants and is becoming a very independent little lady (although, the grunting and pointing thing is becoming a little old...).